VertaseFLI was contracted by ALDI Stores UK Limited to undertake demolition and remediation works on a former petrol filling station site in Newbury. Site investigation works undertaken across the site had identified elevated concentrations of total petroleum hydrocarbons (TPH) associated with the sites former use as a petrol filling station and workshop. 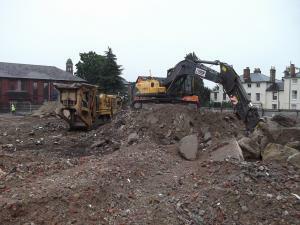 Remediation works were required to allow the redevelopment of the site as an ALDI food store. VertaseFLI became involved with the project at an early stage thanks to early consultation with the client and appointed consultant. VertaseFLI worked with the consultant to design and implement a robust site investigation, including undertaking a detailed quantitative risk assessment (DQRA) to establish site specific target levels. The site posed a number of challenges including its location above a principal chalk aquifer. 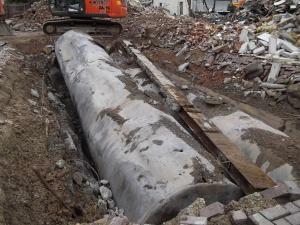 Establishing the most appropriate remediation solution involved substantial liaison with the regulators (Environment Agency and Local Authority) to determine an appropriate validation methodology for remediation works. VertaseFLI was contracted to undertake all necessary demolition and remediation works to ensure the site was left suitable for redevelopment. Site work included the hand demolition and offsite disposal of a large cement bound asbestos roof and associated asbestos within buildings. Asbestos was managed in accordance with the recently revised “Control of Asbestos Regulations 2012”. Demolition of above ground structures included careful removal of a party wall, demolition of a basement, ground slabs and additional buried slabs, onsite processing / crushing of generated demolition arisings to a suitable recycled aggregate, removal of 8 USTs from the subsurface, bioremediation of TPH impacted soils and control and treatment of groundwater encountered during the works. The site was reinstated with site won treated soils and recycled aggregate with surplus aggregate stockpiled onsite for subsequent reuse by the client. Experience gained globally and delivered locally captures what you get when you engage VertaseFLI.